WEEKEND SIESTA HOUR NOW BEGINS AT 2PM! The full dinner menu is available at the bar beginning at 5:30pm. To reserve a table, please visit Resy.com, contact us by phone at 323.474.6624, or email us at info@otonorestaurant.com. Otoño is a progressive Spanish-inspired restaurant concept exploring tapas and paella beyond tradition and through a modern, urban lens. Our food is influenced by many cultures and artistic expressions while embracing the bounty of California's land and sea produce to curate a unique dining experience for the vast ethnic palate of Los Angeles. Otoño is a place where innovation and creativity do not stop at the kitchen but spreads through the dining room, creating a holistic approach to service and the guest’s experience. In that regard, the belief that the dining room starts in the kitchen will be deeply rooted in the team philosophy and mission statement delivering a dining experience unlike any other in the city. Spain is widely recognized for its wine and sherry, however, most do not know the country’s obsession with gin and tonic, or the glory of its wonderfully complex vermouths, or even the brandy used in Jerez to produce its spectacularly unique sherry. Recognizable Spanish beers will be poured on draft while small batch, craft beers can be enjoyed by the bottle. “Vermut” can be enjoyed from draft or by the glass, on the rocks or neat, and is a perfect opening or close to a meal. Our wine list will have strong Spanish representation from well-known heavy weights of the region to small, lesser-known up-and-comers, and boutique producers. On a recent trip to Europe, Chef Montaño sought to explore the many dialects of paella in the Catalan region of Spain including the birthplace of the dish: Valencia. From the celebrated, established institutions practicing traditional techniques to the young, ambitious chefs seeking to revolutionize the experience, the significance and relevance of this dish to Spanish cuisine and culture was deeply felt throughout the region. It was here, where the intermingling of the Old and New World played out over a rich canvas of cuisine, art, and culture, that the idea for Otoño was set into motion presenting an opportunity for Montaño to further express her devotion to the genre and create something new for the magnificent food city of Los Angeles. Teresa Montaño is a New Mexico-born, Los Angeles-based Chef, best known for her first restaurant, Ración. Ración was highly acclaimed by Food Critics Jonathan Gold, Amy Scattergood, and Besha Rodell, and was named an LA Times 101 Best Restaurant for the entirety of Teresa's tenure. Ración also received multiple accolades from LA Weekly and LA Magazine, and recognition on the Diner's Club World's 50 Best Restaurants Discovery Series. Teresa’s modern perspective on Spanish cuisine integrates creative use of technique and ingredients with a Californian sensibility and aesthetic. With roots in the organic food industry and time at local organic farms and the Tender Greens opening team, Teresa developed a strong sense of stewardship towards the environment and conscious business practices. Recently returned from a two-month autumn tour of Europe which included research in Copenhagen, Denmark, Barcelona and Valencia, Spain as well as pop-up concepts in Puglia, Italy, Teresa is thrilled to bring Otoño to Los Angeles. Wine Director Katie Putterlik, a Los Angeles native, curates a diverse selection at Otoño, complementing the Highland Park restaurant’s progressive Spanish cuisine. Having fun along the way, she corrals an expansive list of wines, primarily from Spain, but also California and other worldly regions, focusing on up-and-coming producers, bottles with a sense of place, and those with indigenous varietals and practices. The playful, approachable list—and its large by-the-glass collection—encourages guests to explore new wines and expand their palates. Her affinity for natural selections also guides the program, and extensive server training empowers her team to feel comfortable discussing wines and regions. Fully invested in Otoño’s food, drink, design, and overall ethos, every staff member evokes impactful passion that delivers a holistic neighborhood dining experience. Throughout a career in wine-centric East Side restaurants, including award winning Noir Food & Wine, Katie cultivated a sense of exploration by highlighting underrepresented wine regions alongside equally adventurous cuisine. After a travel hiatus to India and Mexico, Katie helped launch Claud & Co Eatery, a neighborhood-centric concept with monthly changing menu themes. She then helped the group open Bacchus’s Kitchen, an Altadena neighborhood wine bar and restaurant in 2015, serving as Director of Operations and Event Coordinator. Katie developed a friendship with Teresa Montaño when Claud & Co. collaborated on events with Montaño’s Ración restaurant, and a friendly chat over coffee in early 2018 turned into the opportunity to lead Otoño’s wine program. We are always on the lookout for front and back of the house talent! We are looking for passionate food and beverage professionals interested in joining our team. To apply please click the button below and follow the instructions. We look forward to hearing from you and having you a part of the Otoño family. Originally constructed in 1928 by S.H Kress & Co, this simple building was built in the iconic commercial vernacular style that would come to define the Highland Park neighborhood, one of LA's earliest subdivisions. The company, a five and dime retailer, used a consistent design language in its stores, employing broad cornices, transom windows, large lettering, and a distinct yellow palette to create a "signature storefront" for it's brand. 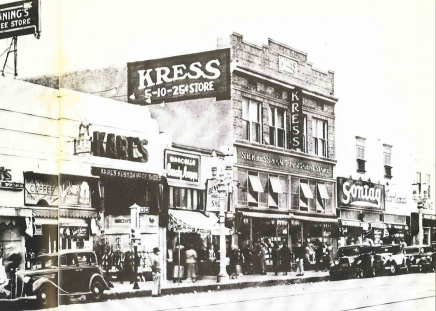 In addition, Kress & Co wanted their stores to serve as community gathering places, and an eponymous foundation, established in 1929, gave away millions to those communities over it's tenure. The building was purchased in 1979 by Frank and Vera Vacek, who opened a family run camera store that would grace North Figueroa street for more than three decades. The distinctive signage and storefront were installed in this period, while preserving the signature brick and fenestration features of the earlier department store. A local fixture in the era of film photography, Frank's was the source for all the latest gadgets in the industry and even sponsored local fashion and model expositions, furthering the role this building has played as a community asset to Highland Park. Purchased by Engine Real Estate in 2014, the building underwent a historically sensitive adaptive re-use renovation under the Mills Act, adopted in LA in 1996 for the preservation of landmark buildings, and is in one of the only historic overlay zones in the city with commercial properties. The windows and brickwork of the original 1920s façade were restored, the interior rehabilitated, and numerous structural upgrades were put in place. The landmark signage from the decades old Frank's Camera were also restored, and will become a fixture for the new life of the structure.